The newest Free-to-Play MMORPG Realms Online is offering exclusive in-game items and keys to all members of The Escapist who want to try it out, including a mount called Ancient Daggerfang! Who doesn't want to ride around on an Ancient Daggerfang mount? 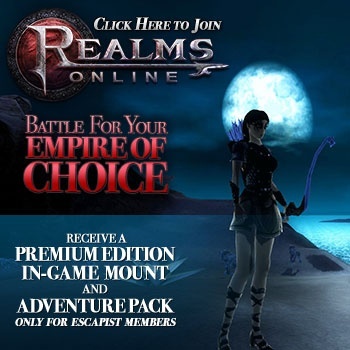 Realms Online is a Free-to-Play (F2P) MMORPG. Choose your Realm and engage in the most dynamic player driven battlefield available on any MMO. Fight for the Alsius Empire, protect the woods of Syrtis or avenge the Borherhood of Ignis. Thousand of players from around the world enjoy Realms Online for free with no level or time restrictions. The only requirement is to fight for your realm! Even better, the fine gaming folks over at GameSamba are offering sweet in-game loot, exclusive to members of The Escapist, which includes an Ancient Daggerfang mount to cruise around the world in style, as well as some uber potions to help you level and stay alive. It's free to play, so invite a friend, grab a key and have some fun! To see how to get your premium items, your free account and start gaming with other members of The Escapist, head over to the contest page by clicking here.